Chhota Spikes is a small 12” x 10” sling bag, which can easily accommodate a book or two, your wallet, your keys, mobile and shades and you are on the go for the short trip, when you do not want to be bothered with a large purse. -DK weight yarn in two contrast colours. I used Vardhman Millenium acrylic approx 85 gms in each colour. Not important. The fabric done in spike stitch is dense so use a hook which is a size thicker than what you would use otherwise. You can customise the size of the bag as per your need, by increasing/decreasing the number of starting chs in the multiples of 5. Spike stitch – Spike stitch is scs done in the rows below. Make 41 ch with the D.
2nd row – sc in first sc, sc in each sc till end. 3rd to 7th row – sc in first sc, sc in each sc till end, ch 1 turn. Change to D. ch 1 turn. 9th row – *sc in the first sc. Spike st 2 into next sc, Spike st 3 into next sc, Spike st 4 into next sc, Spike st 5 into next sc* Repeat from * to * 7 times more. Ch 1 turn. 10th to 13th row – sc in first sc, sc in each sc till end, ch 1 turn. Change to L. ch 1 turn. 15th row – *sc in the first sc. Spike st 2 into next sc, Spike st 3 into next sc, Spike st 4 into next sc, Spike st 5 into next sc* Repeat from * to * 7 times more. Ch 1 turn. Repeat from 9th to 20th row till you get the desired length for the bag. I repeated 4 times more. Repeat 9th to 14th row once more in D.
2nd row –sc in flo in each sc till end, ch 1 turn. Repeat 1st and 2nd row 5 times more. Fasten off keeping a good length of yarn for stitching up the tube border. Attach D at the CO end, with right side facing, working on the loops of beginning ch row , sc in each of the 40 sc, ch 1 turn. Next row – sc in each sc till end. Join L ch 1 turn. Beginning with 3rd row repeat as in First side till roll on tube border. Fasten off keeping a good length of yarn for stitching up the tube border. Taking one strand each of D and L and a 5.5 mm hook, make a ch as long as you want the strap to be plus 11” (this extra part will go inside the tube border. Sc in the second ch from hook , sc in each ch till end. Fasten off. Join the edges of the strap, without twisting the strap. It’ll form a long untwisted ring. Fold the piece along the CO ch line with right side out. Join D near beginning ch row , join the two pieces together with scs putting the hook through both sides together, evenly along the side, only upto the last spike st row. Do not join the sc rows meant for the roll-on tube border. Repeat with the other side. Fold the border into half, folding it towards the outside so that the edge is aligned with the first row of sc in the border, do not join as yet. Attach the magnetic clasp at the centre of the border at the inside of the fold on both sides.This way the metal washer of the magnetic clasp will be inside the fold and not visible. Then place a strap inside the fold on one side of the bag, placing the joined part in the centre so that it will not be visible once the tube is folded over and sewn. Tack the strap inside the tube with small stitches. Repeat with the other strap. Now sew the edge of the tube border aligning it with the first row of border sc with small stitches. Line it with a matching fabric. I attached a pocket too with a fabric in contrast print. Now put in your books, keys, mobile and the keys and you are ready to go out with your Chhota Spikes! In case some error is noticed or any part of the pattern is not clear or difficult to understand, please let me know. This pattern is free for non-profitable/personal use and gifting purposes only. And not for commercial use. Please do give credit for this pattern, whenever you use it – linking it to my post and/or blog. Dakia means the Postman in Hindi, who in my childhood always had a bag of this sort ( a larger version made of canvas and full of letters for all) hanging from his shoulder. This was the pre-e-mail days, when we used to eagerly wait for the arrival of the Postman. Dakia bag is a messenger bag, which will come handy for you when you need to carry a book or two and a few more things like your phone and shades and your keys and do not want to carry a large bag. Use of this combination of colours was there in the back of my mind for a while, but then I was a bit apprehensive as to whether this would be liked by others. 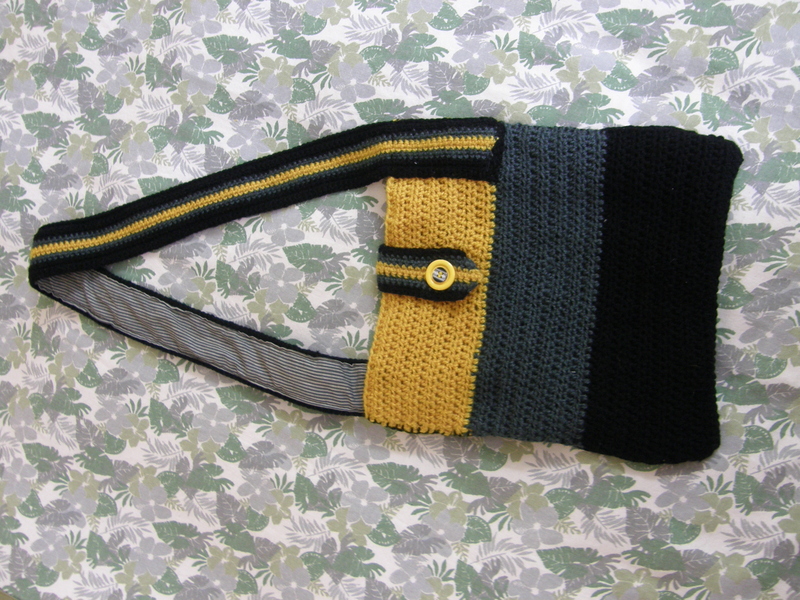 The friend for whose birthday I was planning to make a bag gave me a free hand to select the colours. And I used these two sober colours to be offset by the bright one. 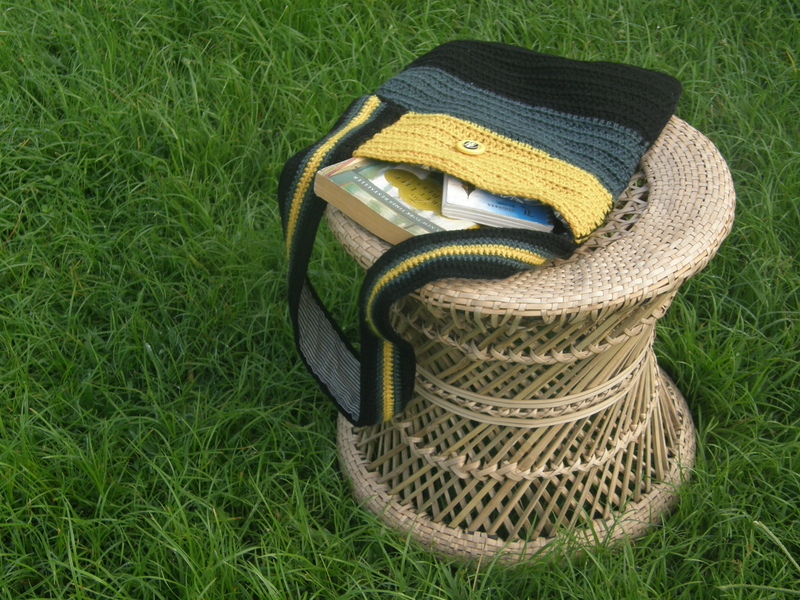 As the crocheting progressed , and I completed the body, the idea of placing the straps in a different way formed and on a trial it looked fine, so I went ahead and finally put it and found that the balance of the bag is not lost. The closure is also crocheted separately and stitched on. -DK wt yarn of your choice of colour. I used Vardhman Millenium ,acrylic, DK, in shades of black, gray and golden yellow. -Fabric for lining and matching thread. -Buttons for closure strap. 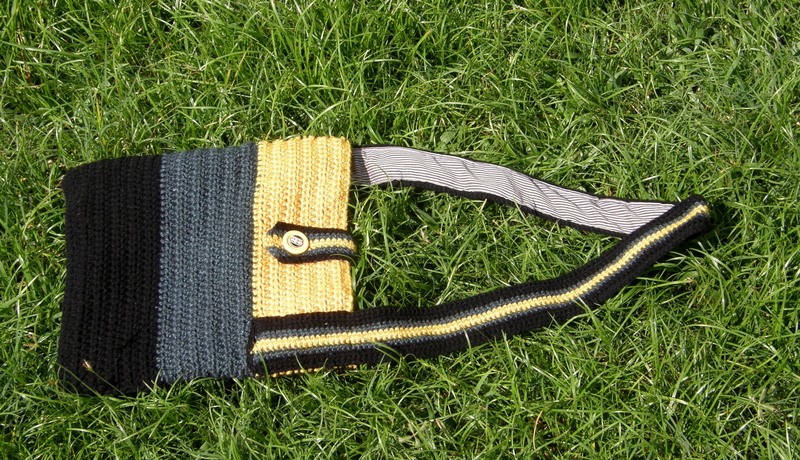 I used a large golden yellow and a smaller one with gray and black zig-zag lines. -Pearl-headed pins to tack in the pieces in place. 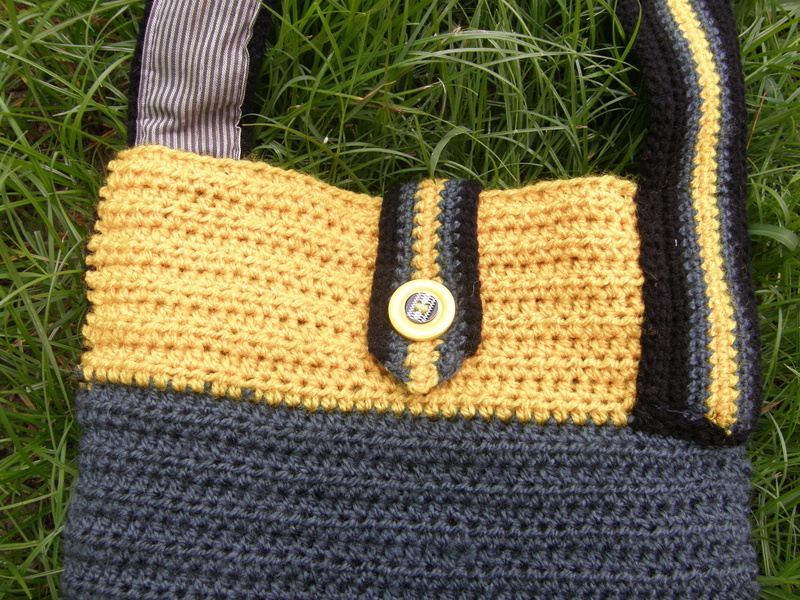 You can customise the size of the bag as per your need by increasing/decreasing the number of starting chs, the width of crocheting in each colour following the basic scheme. With Black and 4.5mm hook make 45 chs. Row 2 – hdc in each sc till end, ch 2 turn. Repeat Row 2 in black till you reach 4” starting from the first hdc row. For changing colour on the last st of last row of black – yarn around, insert hook into the last hdc of previous row, pull yarn through (you have three loops on your hook), now join Gray yarn and pull through the three loops on hook, ch 2 turn. Next row onwards continue working on Row 2 with Gray, till the gray part measures 4”. Change to colour Golden Yellow, changing the colour the way described for gray above. Continue Row 2 in Golden Yellow till the Golden Yellow part measures 4”. In the last row of Golden Yellow make ch 1 instead of ch 2 and turn. Last Row – sc in each hdc of previous row. Attach black with right side of the work facing you, at the start of the beginning ch row. Do Row 1 in the beginning ch loops till end. Do Row 2 with black till the black part measures same as done in first side. Change to colour Gray and do Row 2 till the gray part matches the width of the same in first side. Change to colour Golden Yellow and do Row 2 till the Golden Yellow part matches the width of the same in first side ending with the sc row. With Black ch 195. Keep a long tail, approx 12”, which will come handy in joining. Row 1 – sc in the 2nd ch from hook, sc in each ch till end, ch 1 turn. Row 2 – sc in each sc of previous row, ch 1 turn. Change to Gray, do 2 rows of Row 2 in Gray. Change to Golden yellow, do 2 rows of Row 2 in golden yellow. Change to Black, do 3 rows of Row 2 in Black. Do 1 row of sl st in black in each sc of previous row till end. Fasten off keeping approx 12” yarn tail for joining. Row 4 – sc in each of the next 32 sc, ch 3, skip 3 sc (created the buttonhole), sc in each of the next 3 sc , 2 sc in last sc, ch 1 turn. Row 5 – 2 sc together (reduced one st) sc in each sc till the 3 ch, sc in each ch, sc in each sc till end, change to Gray when two loops of the last sc are on hook, ch 1 turn. Row 9 – sl st through each sc till end . Fasten off with a long tail for joining. 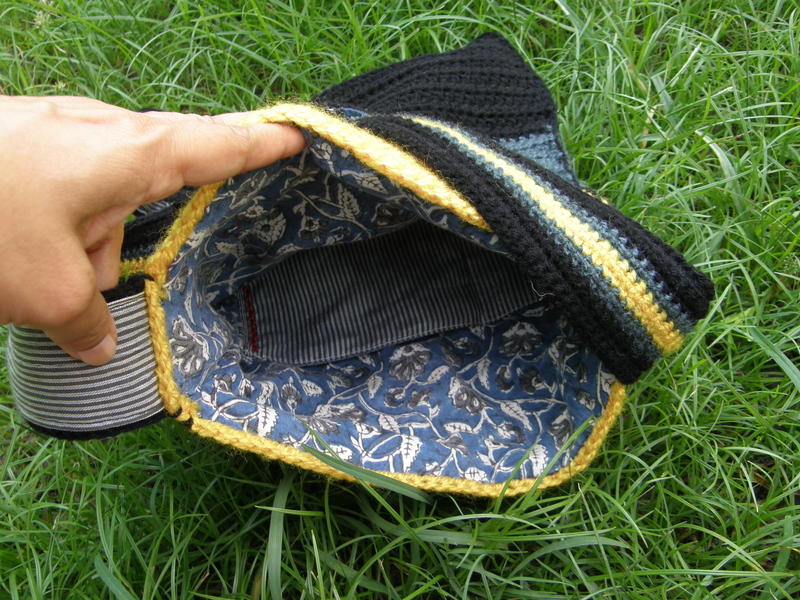 Fold the bag along the beginning ch line with right side out and join the sides with black yarn and blanket stitch. Yes, the stitches will be distinctly visible when done across the olden Yellow and Gray part. I felt, it just adds to the charm. Position the Closure at the centre of the bag also ensuring that the both sides are hanging equally on either side of the bag, tack the base part of the closure with the body of the bag with pearl-headed pins so that position does not shift. Sew about one inch square of the base part with the body of the bag with small hem stitches with the yarn that you left as tail for this purpose, securing it properly. On the other side f the bag, aligning with the buttonhole created in the closure, sew in the button of appropriate size. I stacked a smaller button on top of the large one and sewed both together in place. I put a lining to the strap too for added firmness. If you wish to do so, please line it before you attach it to the bag. Now place the straps as shown in the photo. Place one end aligning with the edge of the bag on the side and where the Golden Yellow part ends at the lower edge. Tack it in place with pins and sew it along the area overlapping the body of the bag. Fold the strap in a way that other end of it comes in the same part of the body of the bag as the first end but at the other end. Sew it on the same way as the first end. Remember, you have to stitch the area of the strap which overlaps the body of the bag (this will be a rectangular part and secure the strap firmly to the body). Now line the bag with your choice of fabric. I put an inner pocket too, with a contrasting fabric and before attaching it, did one row of simple embroidery stitches along the two sides. You can modify the lining to your liking, can even add a zipper if you wish. Now you are ready with your Dakia bag!! Put in a book, your sketch pad and pencils, a small project and a few more things and you are ready to go out!! 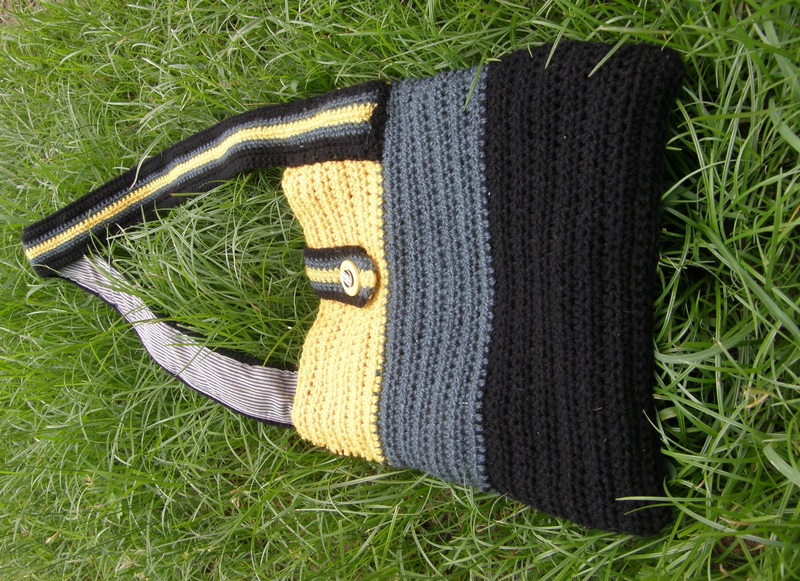 Here is my Dakia Bag in Ravelry.